That is sooo awesome!!! Good job! That's such a simple idea, but it looks so great. Your dog looks a little confused, though . . . Poor thing. Very cute costume. Adorable! 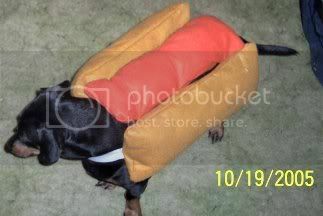 I love little hot dogs! 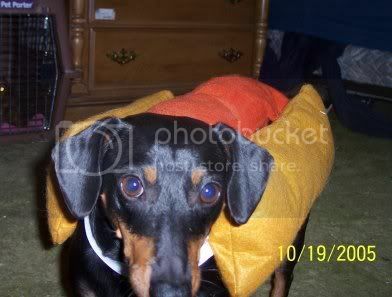 I have one too...we made her a costume like that for halloween one year too. Unfortunately she kept it on for about 2 minutes, and then decided she wasnt going to humor me any longer. Yours is done very nicely though. The elastic around the neck was a good idea! Compassion: my twisted weakness, my downfall, the illness to which so many others have become immune. 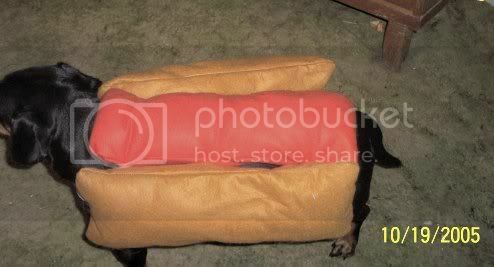 Your dog makes such a cute hot dog! 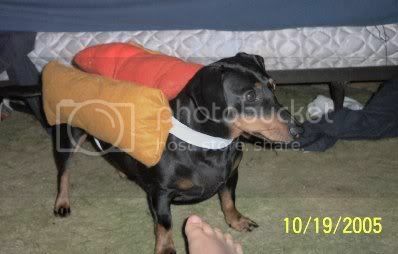 He does look a little nervous... Maybe he knows what a hot dog is!!! Too cute!